Pink Floyd are the obvious choice to compare any band ploughing a trough through the field of psychedelic rock with, but from the first droning note of, opener and title track, "Orion" it is hard not to make that comparison. McVay's Gilmour-esque guitar tones swirl around a background of lysergic rhythm and texture coated in mellow, laid back Floydian vocals creating a groove that although created in the USA has a strangely "English" feel. "Monolith" jams a similar Floydian groove that takes its cues from the earlier period of that bands career and then mixes into those grooves elements of grungy Americana and shoegaze indie. McVay's warm croon floats majestically over the songs foundation of fragmented guitar chords and arpeggios, superbly backed by Reynolds spacious bass lines and Donaldson's busy drumming, his mellow tones complimented by the drummers harmonious vocal accompaniment. "Sleeps On The Vine" although not strictly a blues song does however carry a feeling of that genre in its moody and atmospheric execution. McVay chops from his fretboard sharded guitar chords and spatial licks that hang in the air, echoing around the mellow lead and vocal harmonies. The guitarist soars to even greater heights when in the songs final third the tempo increases and he unleashes his inner guitar hero and takes the song to the close with a searing six string display of emotion and technique. "Kerosene" begins with Donaldson laying down a solid backbeat into which Reynolds injects a deliciously seductive bass line before Mcvay's guitar enters wrapping siren-like motifs around an equally delicious vocal. The songs superbly delivered verses are interspersed by moments of heavy psych riffage that at times recalls, Canadian psych cult favourites, Quest for Fire and sees the band hitting a groove a little grittier and a touch more "stoner" than previously heard. "Goliath" is a two part piece with the first part being an atmospheric instrumental journey tinted with eastern themes and psychedelic colours and texturing that slowly builds until, with a brief pause, erupts like a volcano into the stoner/desert groove of part two. A heavy circular McVay riff, dripping with fuzz and driven by the astonishing rhythmic dexterity of Donaldson and Reynolds hits the listener like a steam train, demanding attention and getting it. The vocal similarities to Pink Floyd, of previous tracks, are here jettisoned for a more shoegaze vocal approach that, to this listener, share tones and shades with Massachusetts stoner/psych noise artists Elder in their less abrasive moments and.give the song a hard edged and almost alt-rock feel. 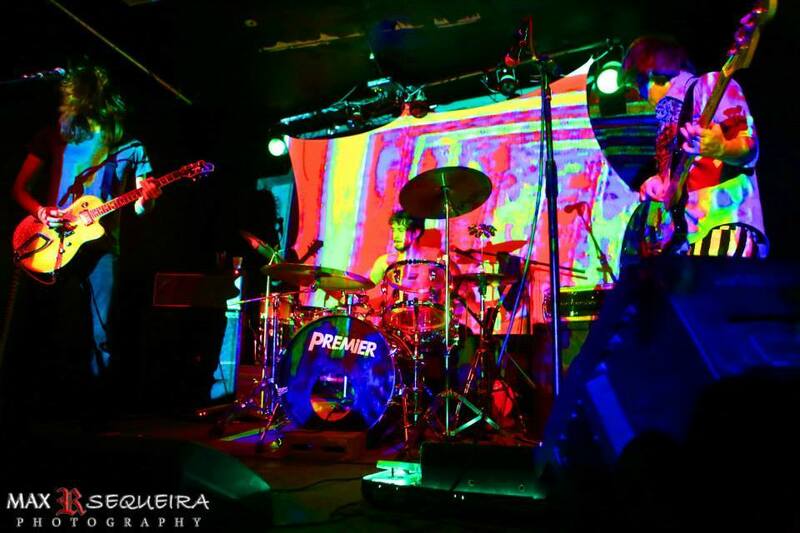 "Orion Subsiding" sees the band once again step into the arena of bluesy psych, the songs hazy,smokey and heavily lysergic grooves further enhanced with the addition of jazzy guitar interludes wrapped around perfectly pitched and laid back vocals. Reynolds big bass sound sits on top of Donaldson's restrained rhythmic backbeat allowing McVay free reign to fill the spaces with colourful hooks,licks and motifs. The band move it up a gear for the songs middle section hitting a brief but effective heavy desert groove before everyone falls back into line and the songs initial psych refrain takes things to the close. "Drinking From The River Rising" begins with a folky, almost celtic, vocal lament over a slowly increasing droning effect, McVay's voice is mournful, weary and emotive as he sings of "lonely mountains" and "rivers winding". 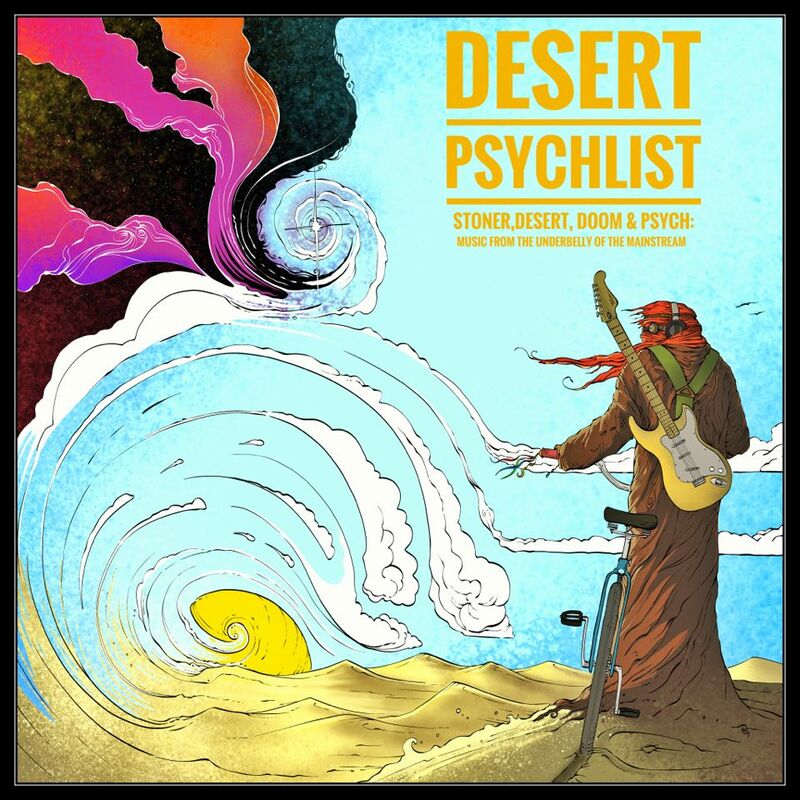 The rest of the band then come in, wrapping the vocals in a blanket of psych drenched groove interspersed with moments of gnarly desert riffage and heavy stoner rhythms. The songs final third sees the band pulling out all the stops laying down a heavy barrage of psych soaked riff'n'rhythm with all three musicians going hell for leather on their respective instruments until collapsing into the fade on a wave of sustained feedback. 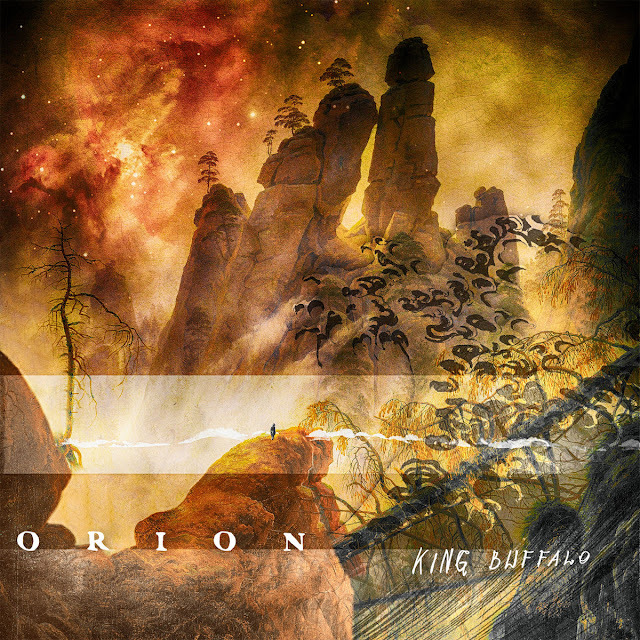 King Buffalo have created within the grooves of their debut album "Orion" a music that deserves a wider audience than the stoner/psych and doom underground niche thay currently inhabit whether this will happen is hard to say but if they continue to produce music this good, this exciting and vital then who knows what the future holds. Nice review! One of my new favorite albums. I play this one just about every day!